German chancellor Angela Merkel, Cologne mayor Henriette Reker, and other Christian Democrats, Social Democrats, Free Democrats, Greens, and Left Party members in Germany find themselves about ready to be lynched by a majority of the German people. 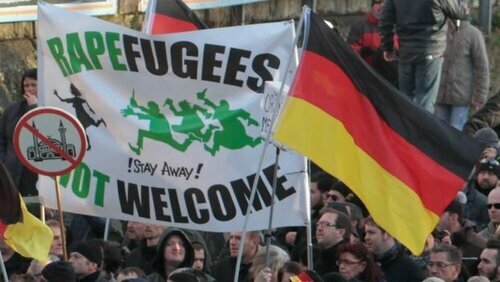 German political leaders threw open the borders of Germany to swarms of mostly Muslim migrants from the Middle East and North Africa. Over a million migrants, some possessing unauthorized Syrian passports stolen from Syrian government offices and Turkish work permits issued by the Islamist government of jihadist-enabler Turkish President Recep Tayyip Erdogan, entered Germany in the last year. Stung by the threats posed to German citizens by the young male migrants, German political leaders are now reaping the whirlwind of public opposition to the welcome sign erected by the Berlin government. German «generosity» was repaid on New Year’s Eve when young Muslim men sexually assaulted hundreds of German women on the streets of Cologne, Munich, Hamburg, Dusseldorf, Stuttgart, and other German cities. 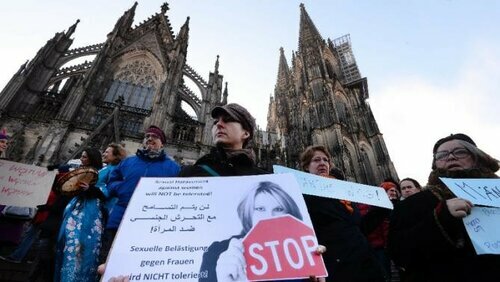 In Cologne, over 350 German women were attacked near the city’s iconic Gothic cathedral. The German government and public and private media did their best to hide the fact that most of the male attackers were «of Arab or North African origin», as it was put by the subsequently sacked police chief of Cologne, Wolfgang Albers. Even with such a wake-up call, some German politicians, for example, North Rhine-Westphalia interior minister Ralf Jaeger, equated the understandable German negative reaction to the sexual assaults by the Muslim migrants to the actual sexual assaults themselves. Jaeger said, «What happens on the right-wing platforms and in chat rooms is at least as awful as the acts of those assaulting the women... This is poisoning the climate of our society». UK Independence Party (UKIP) Member of the European Parliament Jane Collins rightly criticized Jaeger for his unthinking xenophilia when she stated: «How dare this dreadful man make such a comparison? He is wrong and he should apologize». Jaeger did not apologize and there were no other apologies forthcoming from such German xenophiles as Merkel, Reker, or German Social Democratic vice chancellor Sigmar Gabriel. In fact, Reker issued instructions for German women to show some tolerance for the ways of the Muslim men by traveling in groups and steering clear of areas where they congregate. Jaeger’s and Reker’s opinions are not unique among European and other Western political leaders. Jaeger actually tried to psychoanalyze those who sexually assaulted the German women by claiming the men were intoxicated with alcohol and drugs and then tried to act out their fantasies of sexual omnipotence. In other words, their Islamic jihadist underpinnings had nothing to do with their animalistic behavior, according to Jaeger. People like Jaeger, Merkel, and Reker are classic xenophiles, people who have an odd attraction to foreign peoples, manners, or cultures even when those people, manners, and cultures are detrimental to their own cultures and peoples. Jaeger, Merkel, and Reker were quick to condemn those who argued for tighter border controls and better vetting of migrants as «xenophobes.» However, given the harm done by the mainly young Muslim men who now prey on defenseless, mostly Christian woman, on the streets of Germany, Austria, Sweden, France, Finland, and Norway, it is clear that xenophiles pose a greater danger to the future of the civilized West than do the xenophobes who are trying to sound the warning klaxons about the dangers posed by young migrants, many of whom are natural rapists owing to their jihadist religious indoctrination in their countries of origin. In fact, a German government report cites the Muslim tradition of «taharrush gamea», the sexual harassment of women by large crowds of men, as one of the reasons behind the attacks in Cologne. Warnings from European political leaders that unchecked immigration from the Middle East, North Africa, and South Asian countries like Afghanistan and Pakistan will place Christians and others who are considered «infidels» by Wahhabist and Salafist Sunni clerics in danger are dismissed by xenophiles as fear mongering. International hedge fund tycoon George Soros and his media operations in Europe and North America have demonized anti-immigration groups and political parties as xenophobic and racist. Soros and his minions have little to say about «taharrush gamea», which was also highly prevalent on Tahrir Square in Cairo during the Soros-supported «Arab Spring» uprising. European reaction to the rapes by Muslim migrant men continues to place more emphasis on tracking down and punishing so-called «vigilantes» who are doing the jobs of the police in protecting European women from street attacks. German Justice Minister Heiko Maas, echoing Jaeger, continued to equate the street assaults of women by the migrants in Cologne to «agitation against foreigners». Maas saved much of his warnings of government action for those who are opposed to mass migration than to the criminals among the newly-arrived immigrants. Maas fails to understand that Germans interested in protecting German women and the German way of life are not agitating against Brazilians, Taiwanese, Thais, Cubans, or Fijians visiting and living in Germany but against the young shiftless males from Syria, Iraq, and North Africa who entered Germany with cash, smart phones, debit cards, and phony passports via Erdogan’s emerging neo-Ottoman caliphate of Turkey. The leader of the anti-immigrant PEGIDA movement in Germany, Lutz Bachmann, accused Merkel, Gabriel, and other German leaders of being responsible for the rapes in Cologne. On cue, the German and international media condemned such statements by people like Bachmann and others as xenophobic. Even the term «neo-Nazi» was hauled out to berate those who object to the selling out of Europe to swarms of mostly economic refugees from abroad. Meanwhile, rather than help stem the negative reaction to the outrages committed against the citizens of Europe, whether they are «taharrush gamea» rapes or terrorist attacks on people sitting in restaurants or commuting on trains, Muslim leaders have noticed that there are a number of unused and underutilized churches in some European cities. These Muslims want to buy the churches and turn them into mosques. Meanwhile, Erdogan, whose dirty fingerprints are all over the mass migration of Muslims into Europe, is planning to turn the former Holy See of the Eastern Christian Church of Constantinople, the famed Hagia Sophia, which has been a museum since 1935, back into a functioning mosque. Merkel’s co-option by the Soros globalists and xenophile political leaders of the West earned her Time magazine’s «person of the year» for 2015. Although Merkel is basking in adulation from the usual globalist circles that continue to praise Barack Obama being awarded the Nobel Peace Prize in 2009 in his first year in office, eventual praise by Europeans will be bestowed to those who had the awareness and fortitude to stand up to the existential threat to European and Western civilization by people whose social habits are straight out of the 13th century. French National Front leader, Marine Le Pen, UKIP leader Nigel Farage, Sweden Democrats leader Kent Ekeroth, Italian Northern League leader Matteo Salvini, Hungarian Prime Minister Viktor Orban and others are disparaged by the corporate media and the Soros NGO community as «Little Trumps,» a reference to Republican Party presidential candidate Donald Trump. However, as xenophile political leaders continue to be caught covering up for jihadist crimes, whether they are at the Cologne or Helsinki train stations, a street in West Philadelphia, or a night club in Calgary, the era of the «Little Trumps» and the «Big Trump» is coming, like it or not.